Indecision in the region over where South Yorkshire's HS2 station should be located is making it look foolish to the world, a business leader has said. A site at Meadowhall has been planned for HS2, but growing calls have been made to consider Sheffield city centre. 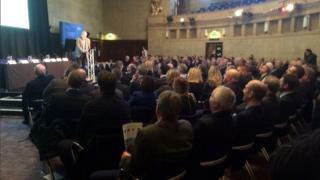 A debate was held at a business summit in Sheffield City Hall, attended by people on both sides of the debate. Jillian Thomas, president of Sheffield Chamber of Commerce, said indecision "did not give the right impression". The preferred route of HS2 phase two runs northwards from Birmingham and stops at the shopping centre, which sits next to the M1. Work on the V-shaped extension is planned for completion by 2033 and aims to provide travel from Sheffield to London in under 80 minutes. A final decision on the South Yorkshire site's location is due to be made by the government shortly. Speaking to BBC Radio Sheffield, Ms Thomas said: "It is wholly unacceptable that we're the only location on HS2 which doesn't even know its station. "This is a once-in-a-lifetime opportunity that we have to get right, and we're looking like fools to the rest of the world." Debate attendees had differing viewpoints on the ideal location for the station. Andrew Denniff, chief executive of Barnsley and Rotherham Chamber of Commerce, said: "Ever since HS2 was announced, HS2 said Meadowhall was the preferred choice. "We think this would provide the biggest impact, not just for business, but for everybody across the Sheffield City Region." Justin Urquhart Stewart, of Seven Investment Management, said: "East-west is actually much more important than north-south in my view, connecting the conurbations, as you get far better economic linkage. "If you're doing that, you would logically say you put it in the centre of Sheffield, as that's where you already have existing connections." He added: "The longer this goes on, the more you're driving business elsewhere."